M1 explain the role of web architecture in website communications On the internet, there are many websites which let you share information with other users. This is where web 2.0 comes in. While many people may think that web 2.0 is a newer version of the World Wide Web, It is actually just a change in the way that developers use the web. Web 2.0 refers to design that is made to help interactivity, information sharing and communication. It includes web communities such as social network sites like facebook, video/photo sharing websites and blogs and wikis. There are many factors which all successful web 2.0 websites share. These include, being easy and fun to use, being affordable, they have a clear purpose and people can add and edit their own information. ...read more. The fact that people are able to access and change information means that the information on the website is not always legitimate. Feeds A web feed (or news feed) is a data format used for providing users with frequently updated content. Content distributors syndicate a web feed, thereby allowing users to subscribe to it. Making a collection of web feeds accessible in one spot is known as aggregation, which is performed by an aggregator. A web feed is also sometimes referred to as a syndicated feed. RSS feeds are a quick and easy way to get the news that matters most to you as soon as it is published (RSS stands for Really Simple Syndication or Rich Site Summary). These feeds contain headlines, links and descriptions and are updated as the website is updated with new stories. ?? ?? ?? ?? BTEC National Diploma IT Practitioners Unit 28 Website Production ...read more. 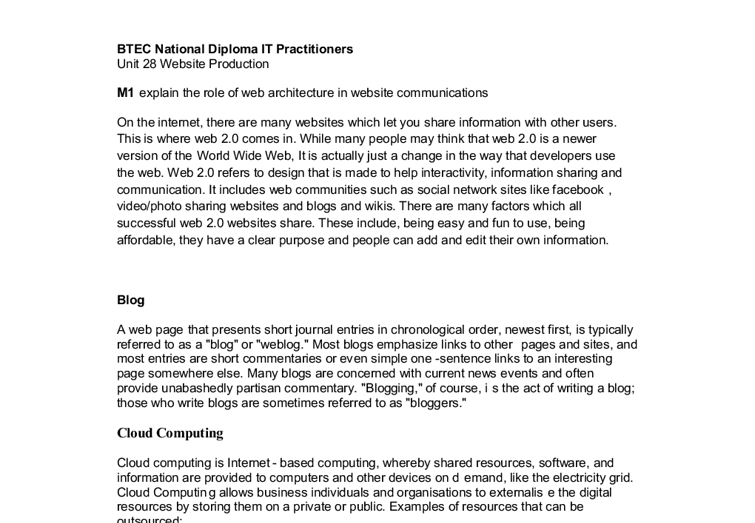 This document provides various examples of web 2.0 based websites but fails to answer the assignment brief i.e. website architecture. The writer neglects describing the fundamental model of a website in terms of server-side and client-side technologies, the processes involved and the associated hardware. Furthermore, the writer does not mention web content management systems, which is expected considering that the writer places an incredible amount of emphasis on web 2.0. Online content management systems are typically dynamic database-driven systems that allow the management of information of virtually all types of web 2.0 based websites Ã¢â‚¬â€œ they serve as the back-end of a website and are heavily customised towards the purposes of the front-end website. The writer focuses too much on the types of services offered as opposed to what the assignment brief is actually asking for, i.e. the web architecture - the fundamental aspects and technical side. The use of diagrams and images would have been an excellent idea in demonstrating the client-server relationship in website communications. 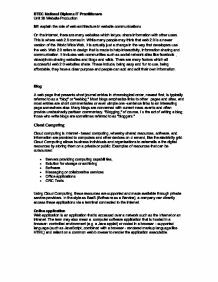 The writer provides examples of the services mentioned and explains their use in good detail. In addition, the writer also provides detailed responses and examples on part 2. However, the document fails to include any citations as evidence. The document largely uses a formal style of writing, with some minor grammatical errors. The writer has also used the appropriate technical terms at this level, though only very briefly (web languages) and does not include other essential terms as described above. Ease of Navigation As I have shown before there is that navigation bar on top of every page, which redirects you to the main information pages you would like to know about, including contacting the business and shipping and order details as well as frequently asked questions. Customers will not buy from somebody they do not trust - people need to know that their information is secure. Customers financial details being leaked can destroy their credit ratings if unscrupulous individuals get their hands on it. ________________ Consumer Credit Act The Consumer Credit Act protects both customers and businesses. 18 year old age group I have chosen these objectives as I believe that they allow me to successfully draw conclusions and answer my aim. The first objective that seeks to understand the reasons behind the growth of mobile phones, offers good background knowledge regarding the growth of this tool and reasons why it has become so popular. and the likelihood of spy ware getting onto your machines the threats from outside are large and considerable. Different hackers are colour coded for the purposes they hack. Blue hat hackers hack commercially to test the security of a site or database. If there is no internet connection select no. You will then need to wait while Vista downloads updates to your computer. This can take a while, depending on connection speed and how many updates there are to download. Windows will then update the operating system. After the updates have been applied, you will need to activate your software, you activate the software by following the instructions on screen. This is obviously a better cable for this reason but it is more expensive than UTP, especially if having to cable large areas. This supports up to 1 MHz bandwidth. Bluetooth - Bluetooth is built into many modern devices to allow data to be transferred between them via a radio frequency.